The first batch of numbers are in for ridership on Atlanta’s brand new $98 million, 2.7-mile downtown streetcar — and the project is off to a rocky start. The streetcar, which opened December 30, is carrying 18 percent fewer riders than anticipated, according to data released by the city this week. That’s actually worse than it sounds because the streetcar is still offering free fares. Passengers will start having to pay $1 per trip in the coming months. In its first six weeks of operation, the streetcar carried 102,000 people. Project sponsors had predicted 124,000, according to the Atlanta Journal Constitution. The city, which is running the streetcar, also says operating costs are 50 percent higher than anticipated. Service was expected to cost about $3.2 million annually. Instead, it will cost $4.8 million. The cost overruns aren’t as alarming upon closer examination. A big chunk of the additional expense comes from introductory fees the city is required to pay MARTA for its cooperation on the project. Those will wind down next year. 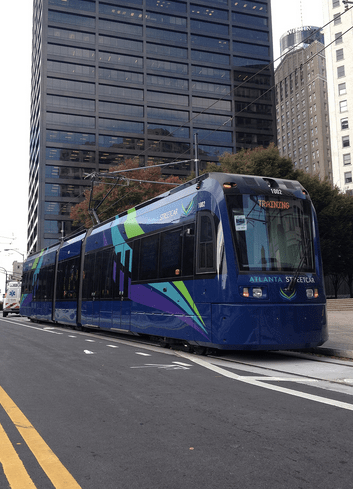 The city also decided to spend $1 million to seek federal funding for additional transit projects, the Atlanta Journal Constitution reports, and that expense has been budgeted to streetcar operations. Critics of the project, including many national transit advocates, have pointed out that the route, which mainly connects the city’s tourist destinations, is of limited use. It also runs in mixed traffic, which makes it painfully slow at times. One question moving forward is whether the city’s experience with the streetcar will affect Georgia transit policy more generally. Darin Givens at ATL Urbanist says the city could make the streetcar more useful by spurring walkable development on the many surface parking lots along the route. He criticized the city for failing to adjust land use policies during the two years leading up to the launch of service. As an Atlanta resident, and huge advocate of transit, this isn’t surprising news. The Streetcar as constructed is supposed to be a piece of a larger network, unfortunately, there is no funding for it. As currently constructed, there is little use for people on the line that you can’t otherwise access by current bus routes or just walking. a single segment of transit increases its value only in so much as additional segments are added to it. A to B is fine and dandy, but add one segment BC and now you have 3 segments and not two, AB, AC and BC. Thus AB has increased value by adding BC. Unfortunately for Atlanta, early scrutiny can devastate a system. This is like the difference between a dog bites man story and a man bites dog story. One is very notable and worth reporting on, one is not too surprising. This headline is so un-shocking, I can hardly believe the story got printed. Can someone explain how the data was found? Who did the study? Who published the numbers? I’ve seen these numbers in multiple places but no one is sharing who came up with the data. No doubt the street car will struggle at first. But if development can come to downtown Atlanta, if there are fewer blocks dedicated entirely to parking along the route, and most importantly, if it can be extended to some more population centers…the streetcar can be effective. You’re overstating that a bit. Some street car systems (e.g. Melbourne) are great transportation networks. They key is making sure we develop our modern streetcars so that they efficiently serve real demand.
? A recent Atlantic CityLab covered this, focusing on the “painfully slow” service resulting from mixed traffic. Bizarrely, the article brought up buses as some sort of solution, as if this would somehow dispel mixed traffic. Do “the same thing” with a bus and the road-maintenance costs end up in a different budget, but what have you solved, exactly? You sure haven’t solved the “painfully slow” problem caused by mixed traffic. It says in the article that the city provided the data and it was reported by the AJC. Buses can go around obstacles, like an illegally parked UPS truck. Streetcars have to just sit there. I think maybe we should all calm down for a moment. The Atlanta Streetcar has managed to begin service during a winter that has been colder than usual for the Atlanta region. As a result, I would imagine that pedestrian traffic is down, resulting in lower ridership on the streetcar (every trip begins and ends with a pedestrian). However, I will critizise the Atlanta Streetcar for a loop routing in mixed traffic. Loops are useless in the overall grand scheme of streetcars and having streetcars run solely in mixed traffic in the Central Business District is insane. Streetcars can be an important and integreated part of a public transport system in CBD’s and surrounding urban neighborhoods (Toronto comes to mind when I think of a North American city with an effective streetcar system); their advantage being that they can provide a rapid transit-like service in both dedicated transitways and mixed traffic while spurring development and increasing property values. But, it only makes sense to have streetcars in mixed traffic in the neighborhoods surrouding the CBD and dedicated transitways in the CBD itself. In the spring, we’ll have insane amounts of pollen in the air, and in the summer we’ll have “bad air” days and heat mixed with humidity — both of those seasons have several days each when people will avoid being outside. The mayor’s weather excuse here is weak. You’ve got a good point about the mixed-traffic slow down. It’s been a really bad problem. When the director of the streetcar came to speak to our Downtown neighborhood association, he assured us that the lights would be controlled to allow the streetcar priority, and that hasn’t happened. Last time I rode it, we hit almost every light red along the route. I hope city departments are working together to solve that problem. But even if the streetcar was completely unencumbered by traffic light delays, it wouldn’t matter. There are just too many dead zones on the route. Many empty parcels, parking lots, parking decks, abandoned buildings — we were led to believe that this streetcar was going to spur development and be part of a greater effort to bring investment (and thus riders and destinations) on the line. Even with the streetcar being a year and a half late in its roll out, the city hasn’t been able to deliver. …this was predicted to be trouble from day one. Buses, in practice, often DON’T go around obstacles. There are plenty of useful streetcar routes in the US; unfortunately there are also a bunch of badly designed ones. …soon there will also be additional US streetcar research published at JPT (Journal of Public Transportation; JPT, free), and Urban Studies (ridership factors)…; most of your comments and concerns are addressed in these papers. Why is it easier to use a streetcar than a bus? Might be some qualitative differences in service perception – streetcars are quieter and less bumpy than buses (except trolley buses) – but I can’t think of any reason why interfacing with the service is any different. Well, at least he didn’t pretend you get *better* service out of a bus! I don’t know about ridership, but those are pretty good construction cost numbers for the USA. Is that for a double-tracked route? It’s a ~2.7 mile loop. It the route for the streetcar had been out Buford Highway, or similar wide thoroughfares lined with apartments, and running in the center with it’s own dedicated lanes, it would have been standing room only from day one, because it would be serving people who would use it regularly. Not many people need to ride daily on a 2.7 mile loop, stopping at every block. In European cities, the streetcars (trams) stop every 3 to 4 blocks meaning less dwell time. Too bad the money was not put towards a long run streetcar line that connected where people worked with where people live…it would have been the best choice as a “starter”, to show what streetcars can do that buses cannot. San Francisco is the showplace of streetcars and light rail on a grand scale, matching cities in Europe. On a smaller scale, New Orleans has great ridership connecting neighborhoods to center center, mostly running in dedicated lanes with classy streetcars, not big boxes like Atlanta. One of the problems is that they made the Atlanta Streetcar too comfortable. In cold or hot weather, homeless people take their naps on the street car. The main purpose of the Atlanta Streetcar was to shuttle tourists from the mid-downtown Centennial Olympic Park to the MLK National Historic Site to the East. It really has no other purpose. There was no alternative to being in downtown traffic. Like other cities that have built low-ridership streetcars, Seattle is facing a choice: keep throwing money at a mode of transportation that hasn't paid off, or stick with it in the hopes that more people will ride routes that connect more places. The new wave of streetcars should be recognized for what they are: economic development projects, not solutions to the transit and transportation problems cities face today.